Now that my finals week is over, and others are going through the stress as I am writing this. I thought I would bring this little book of comedic relief. 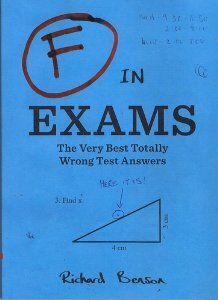 F in Exams brings laughs from reading what students write when they are clueless on exams. It is something to keep your mind at ease if only for the little time that it takes to read it. It is a short book, so don’t worry about it cutting into study time. Everyone needs a break every now and then, right? Take a break from the stress in life and pick this up. It’s sure to make you laugh!